Joe and his wife Alicia have 2 children Makenzie and JC. 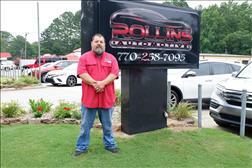 Joe has been a master mechanic for over 25 years and we are proud to have him as our mechanic. He does an excellent job lifting our vehicles as well as inspecting them before they go into our inventory. I was raised in the car business. My father had a dealership in Bowdon in the late 60's through the late 70's. 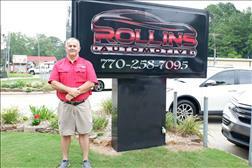 Rollins Used Cars. I graduated High School at Bowdon in 1977 and attended West Central College (formally Carroll Tech) majoring in Auto-Body repair. In 1985 I opened my own repair business and decided to venture into Sales in 2001. I have a beautiful wife of 26 years, Vickie, 5 children, and 15 grandchildren. I would be grateful if you were to give us a chance to earn your business. God Bless you. 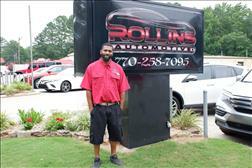 I handle most of the titles and do secreterial work at Rollins Automotive. Dennis and I have been married for 26 years. We have 5 children and 15 grandchildren. 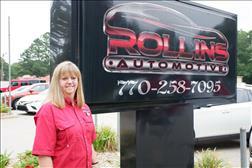 I have been at Rollins Automotive since 2002. I am married to my beautiful wife Amanda. We have 4 children and 7 grandchildren. I have been in Auto Sales for 37 years. I was a Bremen resident for 50 years. I would be honored to show you a vehicle and have a chance to earn your business. I am retired from General Motors. 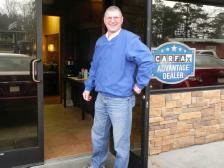 I have enjoyed several years in Auto sales since my retirement. I have been friends with the Rollins family for years. I am married to my lovely wife Ann and have one son Shannon and 2 grandchildren. Mike Hunt is our Detail Specialist. He gets our inventory detailed with precision. We have been blessed over the years with a lot of great detail guys, but Mike is the best we have had. Mike does not do car washes for the public, but if you need a full detail or a wash n wax, he will be happy to take care of you. We appreciate Mike. He is a blessing to our company. A very hard worker. 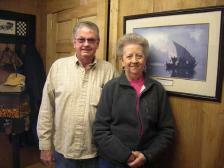 Hanley & Betty Parmer are Vickie's parents. Since Hanley retired they are now transporting vehicles to & from auctions for us.